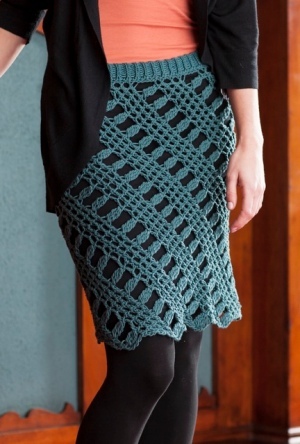 Taken from The New Tunisian Crochet: "The drape and curvy fit of this skirt was created by workig the stitch pattern on the bias. The unique waistband is crocheted sideways onto the top of the skirt in relaxed gauged slip stitch with a carry-along strand of fine elastic thread for exceptional stability and bounce-back stretch." This pattern is from The New Tunisian Crochet, pg 91 - Shantay Skirt. Size J-10 Tunisian crochet or afghan hook and size I-9 standard hook (or size needed to obtain gauge) and fine elastic thread in shade to match yarn are required but not included. Finished Hip Measurements: 36(40,44,48,52)" after blocking. Gauge: 16 sts over 5" and 4 rows over 3". Color Shown is 308 Mallard, but another beautiful option is 315 Bluebell.